was born in Wisconsin, USA. There he earned his Bachelor of usic Degree at St. Norbert College, then obtained his aster of Music Degree from ichita State University, Kansas, SA. He then went to Hamburg, Germany, where he completed an organ diploma at the Musikhochschule. He also completed examinations for church music in Hamburg and Cologne. During his studies Sanders held various positions as organist. In 1994 he switched to a position with regional responsibilities in Tuttlingen (Baden-Wurttemberg). 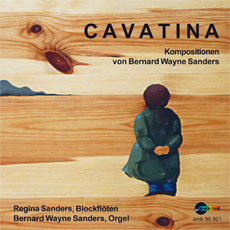 Sanders´ studies in America included instruction in composition. Rooted in an American tradition, his personal idiom is marked by the spontaneous combination of diverse elements. Rhythmic conciseness, melodic accessibility, and organic harmonic changes are reminiscent of various styles, impressionism or jazz for example. His works have also been successful in international competitions.